“Anthropocene Word Cloud from Wikipedia.” Notably, the words colonial, imperial, indigenous, violence, and their derivatives do not appear. 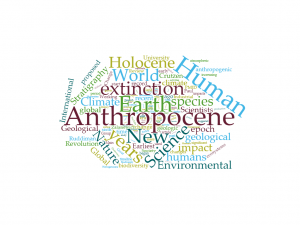 Anglocene, Anthrobcene, Capitalocene, Cthulcene, Eurocene, Manthropocene, Misanthropocene, Neganthropocene, and Plantationocene: this is the current slate of monikers for the Anthropocene, a proposed geological epoch with historical debates over its start-date as deeply entrenched as those over its name. This ever-expanding catalogue of inspiring neologisms, however, suggests more than the schizoid nature of the Anthropocene and reveals more than simply an embryonic idea still in the process of being worked out, although its very existence is not unanimously acknowledged, as the surprise announcement of the Meghalayan Age by the International Union of Geological Sciences reveals . The blur of proposed names for this new geological epoch is the symptom of a deeper unease that we have with the progenitur term “Anthropocene,” an unease that deepens with its disciplining, that is, in a Foucauldian vein, in the way this term is becoming sedimented and accepted as a disciplined body of knowledge . Think, for instance, about the coalition of the Anthropocene Working Group, the task-force that determines the key parameters of this new epoch, a group that, as Oxford economist Kate Raworth shrewdly observes, is overwhelmingly made up of white, European men . This raises the important question of who is the Anthropocene for? Who speaks for it? Who does it represent, and who does it erase? The question we must ask is this: In what ways is a certain structural violence, a colonial violence, smuggled in under the covers of this definition? To think about this dark side of the Anthropocene requires attention to the erasure inherent in this definition of the anthropos (by its Greek roots, a white, universal, European subject). Recent work by Simon Lewis and Mark Maslin, among others, helps to shed light on the ontopolitics of this new epoch, as they rightly identify colonial violence as an inherent factor within the process of humans becoming a dominant force on the earth. Although Lewis and Maslin (2015) date this violence to the late fifteenth century in what they call the “New-Old World collision,” when Europeans arrived in the Americas, the long eighteenth century—the period that many consider to be the dawn of the Anthropocene, or at least the initialization of a new phase in its development —continued to be a hotbed for settler violence twinned with destructive means of terraforming, particularly in North America. In what follows, I offer one particular eighteenth-century event—the British military’s bio-weaponization of smallpox against North American Indigenous peoples—as a touchstone for thinking about this structural violence, an event that might also serve as a metaphor for some of the dangers we continue to face in our conceptualization of the Anthropocene today. We can read this bio-weaponization forward into our own contemporary moment where the Anthropocene turns toward indigeneity as its model for resiliency while still problematically failing to account for the legacy and ongoing structural violence against Indigenous peoples. 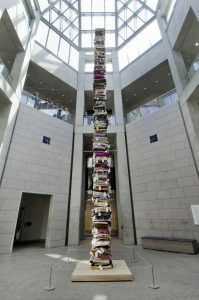 Blanket Stories: Seven Generations, Adawe, and Hearth (2013) by Marie Watt. Blankets were to be infected with smallpox and given as gifts to Indigenous groups, since the use of dogs would prove impractical. Moreover, the bioweaponized blankets were a far more insidious form of violence, and rise to match the colonial fears over the enmeshment of Indigenous bodies and the untamed landscape. Clearly, Amherst’s desired “Total Extirpation of those Indian Nations,”  as he elsewhere writes, was intimately bound up with the project of controlling the land . 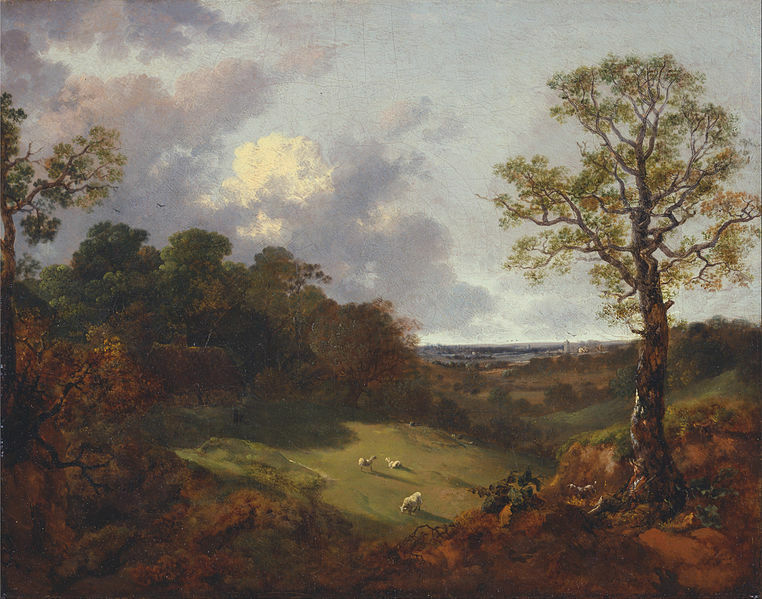 In fact, the colonial biopolitical association of the wild Indigenous body with the land is poignantly captured in an anxious comment by Bouquet in a letter to Amherst (29 June 1763): “every Tree is become an Indian” . The conflation of these bodies bears the scars of Lockean property theory, which conceptually underpinned colonial expansion and the violent treatment and dispossession of Indigenous peoples . For Locke, the difference between merely living off the lands (hunting and fishing like animals do) and cultivating the lands in efforts of improvements is the difference in who has the right to claim ownership of that land. In his Two Treatises on Government, especially The Second Treatise, Locke writes: “As much land as a man tills, plants, improves, cultivates, and can use the product of, so much is his property. He by his labour does, as it were, enclose it from the common” . Put otherwise, it is labour in the service of improvement that grants the right to the earth . From a Lockean perspective, then, unimproved or cultivated lands used by Indigenous peoples were still part of the common, a wasted or missed opportunity for development. Indeed, the same language and colonial logic continues to be used, over two centuries later, in discussions about the Canadian tar sands. As Rick George, former president and CEO of Suncor, the Alberta-based energy company writes, “The most appealing feature of the oil sands was the fact that they were there to be taken” . Yet British efforts at terraforming were simultaneously and intentionally a project of Indigenous genocide, as Amherst’s letters betray. Such an example dovetails with Lewis and Maslin’s “Orbis hypothesis,” their claim that “colonialism, global trade and coal brought about the Anthropocene” . Indeed, their proposed date of 1610 for the onset of the Anthropocene, the Global Stratotype Section and Point  or specific date that marks a significant CO2/carbon decline (that they dub “The Orbis Spike”), is directly the result of drastic population decline due to war, enslavement and disease, with the Americas going from 54 million people in 1492 to only 6 million people by 1650 . In short: less people, less carbon. Colonial violence thus registers itself in the carbon footprint of the Earth. The British efforts to bioweaponize smallpox against the Indigenous peoples in the eighteenth century complement Lewis and Maslin’s theory and furnishes it with a specific event to greater texturize this Anthropocene historiography. “Orbis Spike” in Lewis and Maslin (2015). But what does this specific case study in eighteenth-century British bioweaponization mean for us in the Anthropocene today? Anecdotally, it might remind us about the dangers that can lay await in the folds of a blanket or blanket term, a reminder to be weary of what is “gifted” by this ghostly anthropos, this new ungainly spectre haunting thought today . The case study should also remind us of the biopolitics of controlling the Indigenous populations and their lands, and the violent means that these settler nations called Canada and the United States, or Turtle Island, have deployed since the eighteenth century. But more importantly, as the Anthropocene increasingly dominates scholarly discourse, such that we might speak of the “Anthropocene turn” in academe, the case of the smallpox-infested blankets helps reframe discussions of the Anthropocene that otherwise continue overwhelmingly to exclude Indigenous groups and considerations of colonial violence. We must consider more than the (white) anthropos and fossil fuels. For as Zoe Todd insightfully suggests, the Anthropocene discourse is a variation of “white public space,” that is a space that is not only predominantly made up of the white heteropatriarchy but also a space wherein “Indigenous ideas and experiences are appropriated, or obscured, by non-Indigenous practitioners” . The Anthropocene needs decolonizing and indigenizing, though this move is not without wrinkles. 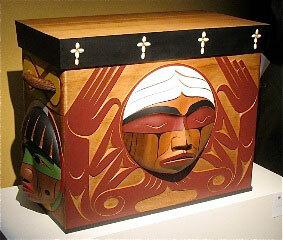 The Bentwood Box (2009) by Coast Salish artist Luke Marston. Now, in the Anthropocene, we no longer have the security in thinking of nature as something “over there,” as an object capable of being fully understood, and the collapse of the nature/culture divide. Now, the “indigenous are the anthropocene-alogists of nonmodern ontology: they can teach us how to see the nonhuman differently” . If Indigenous subjectivity is now a resource to be mined, what becomes visible in this extraction process is the difference between attending to indigeneity and the actual suffering of indigenous peoples. We need to mind the gap between theory and practice. In the turn to indigeneity as the way to navigate the Anthropocene, what dangers are unknowingly accepted as gifts? Like those infected blankets in Amherst’s letters, we would do well to remember to ask what violence gets insidiously smuggled in under the white covers of the Anthropocene, which one might be tempted to call (if yet another neologism were allowed) “The White MANthropocene,” for the way it extends the legacy of this problematic figure, including the tendency of this discourse parasitically to see indigeneity as its new resilient ontopolitical host. Not unlike the eighteenth-century British view of North America as a waste to be mined, contemporary Western discourses including the Anthropocene commit an uncanny act of violence in the turn toward indigenous subjectivity as a new resource to be plundered. The Western question it seems, now as then, remains one of manipulation and self-preservation: How can we use indigenous subjects or knowledges to save ourselves, our ways of life, our institutions, and ultimately our world? We need to recognize, as Alexis Shotwell suggests, the “complex entanglement of practices and habits of ignorance, repression, and active disavowal that constitute an active settler process of not telling, not seeing, and not understanding the truth of the matter” . This is especially true as we wade through a new cold white discourse that still largely ignores a decolonized approach. Retrieving and bearing the anthropogenic ugliness of our eighteenth-century history, those disastrous events, such as the smallpox conspiracy that I have here discussed, will be an important strategy in how we write the history of the Anthropocene, a historiography that although it already includes the eighteenth century and grants a significant place to Britain in this narrative is nevertheless marked by blindspots. It is time to move past the now all too familiar citation of James Watt’s improved steam engine and the Industrial Revolution as the eighteenth century’s claim to the Anthropocene and consider the more furtive forms of anthropogenic violence from this period. Simultaneously, it is also important to recognize the ways in which these forms of violence remain with us today. To do this is to see colonialism, as Patrick Wolfe does, as “a structure rather than an event,” whereby colonial practices of the past grow to become the backbone of the present . Indeed, the pressing task for the historiographies of the Anthropocene will be to consider the minor rather than molar, and increasingly to include in the stories that we tell about this epoch the shameful policies devised and violence committed in the projects and name of colonial terraforming. By insisting on these historiographies that foreground the “complicated, often ugly, and humbling,” to borrow a phrase by Anna Tsing , we might stop perpetuating the structural violence that has defined the Anthropocene. 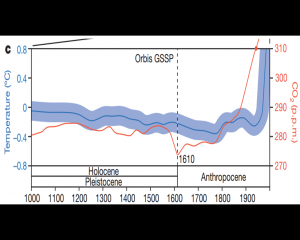 The IUGS announced in July 2018 that we are not in the Anthropocene; we are living in a late phase of the Holocene period that they call the Meghalayan Age, which began 4,250 years ago. It is defined by a catastrophic drought that destroyed ancient civilizations in Egypt, China, India, and the Middle East. As Mark Maslin and Simon Lewis write: “it seems like a small group of scientists [at the IUGS]—40 at most—have pulled off a strange coup to downplay humans’ impact on the environment.” Maslin, Mark, and Simon Lewis. “Anthropocene vs Meghalayan—Why Geologists are Fighting over whether Humans are a Force of Nature.” The Conversation, 8 Aug. 2018. Working groups, conferences, academic journals, courses, and programs are all examples of this disciplining. Raworth, Kate. “Must the Anthropocene be a Manthropocene?” The Guardian. 20 October 2014. Web. Paul Crutzen and Eugene Stoermer initially proposed James Watt’s improved steam engine in 1784 and the Industrial Revolution as the starting point for the Anthropocene. Similarly, others take 1800 as the starting date, such as Steffen et al. (2011) and Zalasiewicz et al. (2011). Steffen, Will, Jacques Grinevald, Paul Crutzen, and John McNeill. “The Anthropocene: Conceptual and Historical Perspectives.” Philosophical Transactions of the Royal Society of London. A 369 (2011): 842-867. DOI: 10.1098/rsta.2010.0327. Zalasiewicz, Jan, Mark Williams, Richard Fortey, Alan Smith, Tiffany L. Barry, Angela L. Coe, Paul R. Bown, Peter F. Rawson, Andrew Gale, Philip Gibbard, F. John Gregory, Mark W. Hounslow, Andrew C. Kerr, Paul Pearson, Robert Knox, John Powell, Colin Waters, John Marshall, Michael Oates, and Philip Stone. “Stratigraphy of the Anthropocene.” Philosophical Transactions of the Royal Society of Lon. A 369 (2011): 1036-1055. DOI: 10.1098/rsta.2010.0315. Peter d’Errico’s archival research was key in finding proof of Britain’s smallpox plans and Amherst’s culpability. For a detailed account of the pertinent letters, see d’Errico, Peter. “Jeffery Amherst and Smallpox Blankets.” Web. 2017. Amherst to Bouquet, 16 July 1763, BL Add MSS 21634, f.323. See also The Journals of Jeffery Amherst, 1757-1763. Ed. Robert J. Andrews. Michigan State University Press, 2015. Vol. 15. 322. Amherst to Sir William Johnson, Superintendent of the Northern Indian Department. 9 July 1763. Amherst, Jeffrey. The Journals of Jeffery Amherst, 1757-1763. Ed. Robert J. Andrews. Michigan State University Press, 2015. This tension over the land plays out in another register today. Amherst is a figure still embarrassingly celebrated by Parks Canada today. The name of the Port-la-Joye-Fort Amherst National Historic Site in Prince Edward Island was recently challenged by Mi’kmaq elders and the Mi’kmaq Confederacy of P.E.I. Yet despite these calls for the national historic site to have Amherst’s name removed, Parks Canada decided to leave it and simply add a Mi’kmaq name: Skmaqn, which means “the waiting place.” Ironically, we still wait for reclamation. Colonel Henry Bouquet to General Amherst, 29 June 1763. Nick Allred’s contribution to this collection also attends to Locke’s theory of property, but it does not address the key role of labour in Lockean property theory and its relation to colonial violence. Katherine Binhammer’s contribution, drawing on Adam Smith rather than Locke, acknowledges the colonial violence that comes with the addiction to economic growth. Locke, John. Two Treatises of Government and A Letter Concerning Toleration. Ed. Ian Shapiro. Yale University Press, 2003. §32; Two Treatises 113. Also in the Second Treatise, Locke grants that Indigenous hunters claim property over their goods, such as the deer they have killed (his example) because they have “bestowed [their] labour upon it” but does not extend to them a property claim of the land as, per his definition, no labour has been exerted (Second Treatise §30; Two Treatises 112). Helbig, Louis. Beautiful Destruction. Rocky Mountain Books, 2014, 57. Lewis, Simon, and Mark Maslin. “Defining the Anthropocene.” Nature 519 (12 March 2015), 177. GSSP is a Global Stratotype Section and Point, a specific date and primary marker (aka, “golden spike”) for any significant change in the Earth system. “The accompanying near-cessation of farming and reduction in fire use resulted in the regeneration of over 50 million hectares of forest, woody savanna and grassland” (Lewis and Maslin  175). J. R. McNeill claims the Anthropocene is the “specter . 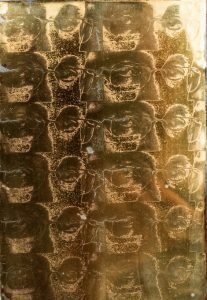 . . haunting academia” (117). Neill, J. R. “Introductory Remarks: The Anthropocene and the Eighteenth Century.” Eighteenth-Century Studies 49.2 (2016): 117-128. Todd, Zoe. “Indigenizing the Anthropocene” in Art in the Anthropocene: Encounters Among Aesthetics, Politics, Environments and Epistemologies. Ed. Heather Davis and Etienne Turpin. London: Open Humanities Press, 2015, 243. Chandler and Reid, “‘Being in Being,'” 257. Chandler and Reid, “‘Being in Being,'” 259. Shotwell, Alexis. Against Purity: Living in Ethically Compromised Times. University of Minnesota Press, 2016, 38. Tsing, Anna. The Mushroom at the End of the World: On the Possibility of Life in Capitalist Ruins. Princeton University Press, 2015, 33. With the premier of the second season of The Crown (2017), Netflix’s extravagant costume drama about Elizabeth II, the show has again occasioned debate among media critics and British historians. Everyone seems to agree that the acting, the settings, the lavish decor, and the meticulously detailed period clothing are all enthralling, but this is also the problem: according to Sonia Sodha, the show “may be good fun, but it’s not always good history” (The Guardian Online). Peggy Noonan admonishes The Crown for its “cheap historical mindlessness,” for taking extreme liberties with the private lives and intimate relationships of ministers at a time when so-called fake news has undermined truth in politics. In other words, the show’s writers and creators adventure to invent what they cannot possibly know. “In its treatment of history,” she claims, “there’s a deep clueless carelessness” (The Wall Street Journal Online). Furthermore, academic historians of Britain and the independent nations that were part of the former British Empire criticize the show for glossing over brutal aspects of the imperial and industrial pasts. Kenya, Ghana, Malaya, New Guinea, and Tonga are reimagined as playgrounds for patrician globetrotters. The complexities of postcolonial politics are neglected; Southeast Asia and the South Pacific are problematically portrayed as spaces of exotic sexual spectacle for the white male colonial gaze. Viewers are offered a kind of Bildungsroman narrative about a reluctant but responsible queen coming into her own as wife, mother, and sovereign. We are asked to “sympathize with aristocrats and an unelected head of state,” Sam Wetherell writes, “The endurance of the monarchy in Britain is an open political question, but it goes unasked in The Crown” (Perspectives). While I want to echo Rebecca Rideal’s recent argument that the show is fiction—it does not claim to be “real” history—and therefore it should be evaluated as drama, here I also want to suggest that it is actually doing something much more compelling in its engagement with historical evidence and narrative (New Statesman). The Crown, I think, should be understood as a secret history of monarchy. Secret history is a revisionist mode of historical writing that became fashionable in the later seventeenth and early eighteenth centuries in England, at a particular moment when popular anxieties about the lack of truth in partisan politics were at a crescendo. Analyzing it as such reveals that the show’s central question is precisely the one that Wetherell claims it fails to ask: How do we account for the affective appeal and almost perverse persistence of the British royal family in a world where, as Lord Altrincham reminds the queen in the sixth episode of season two, “republics are the rule and monarchies are very much the exception”? Other secret histories, however, do not fit this pattern: they are not overly partisan and they aim to allow readers access to the affective lives of royal figures even while their narrative structures reinforce the implausibility of their claims. These are the secret histories of Queen Elizabeth–the first, not the second. 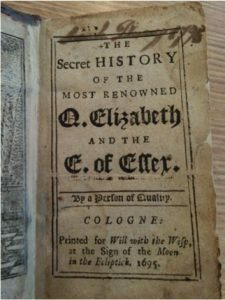 In 1680 The Secret History of Q. Elizabeth and the E. of Essex was anonymously printed in London, while The Secret History of the Duke of Alancon and Q. Elizabeth was first published in 1691. Both continued to be widely reprinted in cheap editions across the eighteenth century, and the accounts they offered were reimagined in chapbook romances, plays, and operatic songs. Both books call into question the celebrated history of Elizabeth’s reign and her status as an exemplar of Protestant queenship. The Secret History of Elizabeth casts the queen as exceptional but amorous, ruled by her love for Robert Devereux, Earl of Essex, reinterpreting his rise, rebellion, and subsequent execution in 1601 as a consequence of the queen’s jealousy and manipulation by courtiers. In The Duke of Alançon, the marriage negotiations that took place between Elizabeth and the French prince in the late 1570s are reimagined to depict the queen as a power-hungry ruler whose love of independence leads her to reject all possible suitors and murder a made-up member of the royal family. Inexpensive and widely available, these stories perhaps invited middling readers to compare themselves favorably to Elizabeth. But, more importantly, the books commoditize the representation of Elizabeth’s personal life in an attempt to appeal to a public that increasingly desired personal access to and connection with celebrated royal figures. Their plots hinge upon the conflicts between queenship, love, and marriage, and they raise questions about how to distinguish between true affection and artifice, and about the kinds of authority the queen must yield to her husband if she marries. For instance, in The Secret History of Elizabeth, readers are privy to implausible conversations that take place between the queen and the Countess of Nottingham, to whom she divulges her secrets in a long narrative that takes up almost the entire first half of the novel. “You do not yet know Me, the Force I have long put upon My Self, hath made you think with the rest of the World, that the Height of my Spirit, hath raised Me above the Infirmities of Nature; and the Greatness of my Thoughts, secur’d Me from the troubles of Life,” the queen declares, “But, Alas! poor Elizabeth is a Slave to Her Weakness” (4). Her weakness, of course, is love. Similarly, after the French prince proposes to the queen in The Secret History of the Duke of Alançon, the narrator describes that she “began to tremble at the prospect of her condition to which she saw herself reduced, not unlike a Person who unexpectedly finds himself upon the brink of a Precipice” (40-41). At other moments, Alançon has an extended debate with a rival lover about the division of authority in marriage, about whether a husband should be his “Wife’s slave” or her “Tyrant” (47). These books therefore reach into the domestic realm. They feign to represent the emotional lives of royal subjects in an invitation for readers to work through their own ideas about love and marriage through the sensational history of a queen—an extraordinary but nonetheless ordinary woman. The monarchy is here cemented into the affective history of the family, made central to conversations about emerging ideals of companionate marriage. These texts never claim to be true histories, nor were they seen as such. As one anonymous critic of secret history alleged in 1691, such books were mere romances, full of malice and forgery, contrived to snare “young Gentlemen and Ladies, who are addicted to such kind of Foolish Toys.”  Thus, much like other criticism of early novels, secret histories were thought to cause a kind of reading addiction among overly credulous readers, not for the revelation of political plots but for their false and morally suspect content, especially dangerous given their low cost. The Crown, like the secret histories of Elizabeth that I have been discussing, draws attention to the contradictions between the public image and the private reality of queenship, and in so doing it highlights the enduring sway of emotion in contemporary politics. Much of the series focuses on the struggles within the royal family and tensions within the royal bedchamber. “What kind of marriage is this? What kind of family?,” Prince Phillip, Duke of Edinburgh demands of the queen after she reveals that she will retain her own surname in season one. The new season ends with a contrite Philip confronting a heavily pregnant Elizabeth as she hides away at Balmoral from the unfolding Profumo Affair, which threatens to engulf the prince. “We both know that marriage is a challenge, under any circumstances,” the queen states as the prince moves to rest his head in her lap, before the show suddenly cuts to her giving birth to Prince Edward. No witnesses, aside from viewers, are present at these intimate moments when sovereignty and conjugality collide. Rather than asking us to believe that these conversations actually happened, the show instead spotlights the ways in which the English royal household remains a space for the popular negotiation of domesticity and the affective bonds of the family. By anxiously condemning The Crown for lying and for misleading viewers who are thought to primarily get their history through popular culture, we replicate the same snobbish discourses with which eighteenth-century critics blasted secret historians: audiences are credulous, we worry, and they mistake the spectacle of romance for the truth of history. This attitude seems patronizing at best. Finally, seeing The Crown as a secret history of monarchy allows us to appreciate how the show self-consciously calls attention to the role of media in the cultural nostalgia of English royalism. The writers repeatedly point out that the magic of regality is a commodity, delicately manufactured through public audiences, radio addresses, and, since the late 1950s, television broadcasts. Elizabeth’s coronation is an exercise in “Smoke and Mirrors,” the title of that particular episode declares, and we follow the camera lens as it reveals (and shields) the spectacle at Westminster Abbey. In the new season, Lord Altrincham criticizes the clipped tone and remoteness of the crown, quoting no less than the Victorian journalist Walter Bagehot’s The English Constitution (1865-67). Bagehot emphasized the constitutional role of monarchy as a kind of innocuous but vital entertainment for the masses. He attributed the sentimental appeal of royal figures to their celebrity status as the public face of the government, allowing subjects to form intimate attachments with individuals they would never meet in real life. “A royal family sweetens politics by the seasonable addition of nice and pretty events,” he wrote, “It introduces irrelevant facts into the business of government, but they are facts which speak to ‘men’s bosoms’ and employ their thoughts” . By exploring how sovereignty is staged for public consumption, by using theatrical drama to unmask royalism as mere theater, and by probing the gap between the public history and fictionalized private lives of Elizabeth II, The Crown presses audiences to consider the political endurance of English monarchy. Rebecca Bullard, The Politics of Disclosure, 1674-1725: Secret History Narratives (London: Pickering & Chatto, 2009). See also Rebecca Bullard and Rachel Carnell, eds. The Secret History in Literature, 1660-1820 (Cambridge: Cambridge University Press, 2017). Michael McKeon, The Secret History of Domesticity: Public, Private, and the Division of Knowledge (Baltimore: Johns Hopkins University Press, 2005). Anon., The Secret History of the Most Renowned Q. Elizabeth and the E. of Essex. 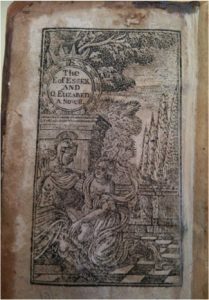 By a Person of Quality (Cologne: Printed for the Will of the Wisp, at the Sign of the Moon in the Ecliptick, 1681); Anon., The Secret History of the Duke of Alançon and Q. Elizabeth. A True History (London: Printed for Will of the whisp, at the Sign of the Moon in the Ecliptick, 1691). All quotations from these editions. N. N. The Blatant Beast Muzzl’d, or, Reflexions on a late libel entituled, The Secret History of the Reigns of K. Charles II and K. James II (London, 1691), “To the Reader” (8). Walter Bagehot, The English Constitution, ed. Paul Smith (Cambridge: Cambridge University Press, 2001). 37.